Jenisvel and Jenny are college sweethearts who are easygoing, caring, and fun! They were one of the most relaxed an easygoing couples we have ever had the pleasure of working with. Jenny is sweet and enthusiastic and Stephen is calm and collected, but with a happy heart! Their day reflected their personality as they had a beautiful and traditional church ceremony. They then celebrated with a reception that was eco-friendly. Their plates and silverware were biodegradable and their decor was inspired by the simple things in life: flowers, trees, and love! They met while both attended Florida State University while Stephen was working at ‘El Centro’ the office space for FSU’s Hispanic Latino Student Union. Jenny stared at Stephen as if she knew him from somewhere and when Stephen noticed her, he asked ” Hi, can I help you? ” “I swear I know you from somewhere… -she replied. They both had that same feeling hmmm maybe I do know this person, but they could not figure it out. Middle school? Nope. Well, maybe but we went at different times. Highschool? Nope… but where??? We never did know until much later… and boy was that a surprise! They had been around each other their whole lives, but never once interacted with each other until that day at FSU. When they first started dating, Jenny posted a picture of them on National Boyfriend’s Day, Jenny’s “cousin” (her dad’s twin brother’s stepdaughter, aka cousin lol) Monica called her and continued to tell her how she had a best friend in middle school named Danielle and that Stephen was Danielle’s older brother. After that, Stephen remembered Jenny from Monica’s house when she was younger and that her mom was married to Monica’s Stepdad’s Twin Brother! This just goes to show how small the universe actually is and with even more reason that these two are soulmates. There were so many times where their lives crossed paths, it was simply meant to be! 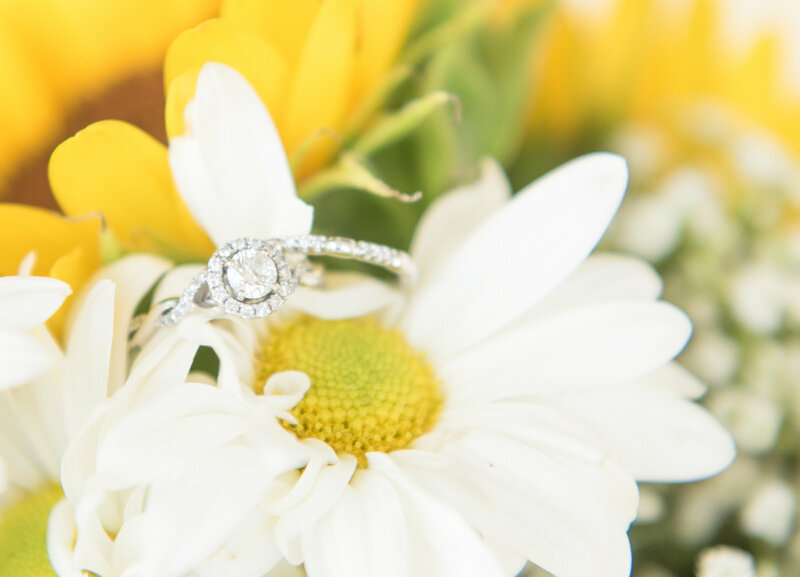 Stephen proposed in a family dinner on Father’s Day weekend, the perfect way to cover up the fact that the entire family was there! Towards the end of dinner, the man that was playing music in the restaurant starts playing a song that Stephen sings to Jenny all the time. Jenny immediately thinks “Oh how sweet!” and right as she glance over to Stephen to let him know that the song is playing, she sees Stephen with a big smile his face and tells her “You know, ever since the day I met you I knew you were special.” Everyone’s eyes were on Jenny and Stephen He proposed! And she said yes! Then confetti flew everywhere, the perfect way to celebrate! Fast forward to their dreamy wedding day, they mixed tradition with earth-loving details and color that makes you smile! Jenny’s favorite flowers are daisies and sunflowers. Daisies and sunflowers have always had a significance to her because the daisy represents her grandmother and the sunflower represents my grandfather. My grandmother was someone that Jenny was very close to and her name was Daisy and her grandmother’s favorite flowers were sunflowers and my grandfather used to grow sunflowers for her in their home to bring her joy. They also used baby’s breathe it is a symbol of long lasting love and it represents the purity of emotion that two people should have for each other during a wedding ceremony. The flowers that the bridesmaids used in the ceremony were also the flowers used in the centerpieces of the table, and her bouquet was the centerpiece on the sweetheart table. There were many special moments throughout the day like when Jenny did her first look with her mom. Her mom raised her as a single mom and has been there for her for every moment of her life. She also incorporated a special dances with loved ones other than the traditional father daughter and mother son. Then, her little brother challenged Jenny to a dance off, which caught her so off guard, and he finished it with the sweetest speech! It was all so great, I love all the memories! They had a traditional catholic wedding ceremony. This was important to them as it was something that they both grew up in (the Catholic Church) and we wanted to keep the tradition alive with the start of their new family. And they do say that it is good luck to have it rain during your wedding, and during that ceremony it was POURING, so I think it’s safe to say that Stephen and Jenny will have tremendous luck in their marriage! It was sunny the WHOLE day before and after! The inspiration behind the wedding day was a feeling, and that feeling was joy and happiness. They wanted a theme that would bring them joy, and for them the rustic theme was the way to go as they often find beauty in the simplest of things. There were lots of wood tones, browns, whites, blues, greens, and yellows. When picking items for the wedding, they often asked themselves “Does this bring us a sense of joy?” It was very important to Stephen and Jenny to not create such an environmental burden. Due to this, many of the items used were repurposed, recycled, or biodegradable. The plates and utensils we used were made of birch wood, so these would compost naturally. The utensil holders were made with butcher paper and a burlap flower, which would also be able to compost. We also made sure to print our thank you notes to our guests on recycled paper and decided to opt for e-invites and rsvps as opposed to using all that paper on traditional invitations. Most of the decor will be re-purposed to decorate their room in their home. Their cake also matched the rustic theme and since their favorite indulgence is Haagen Dazs’ Coconut Pineapple ice cream. it made perfect sense to have their wedding cake reflect those flavors. They did a malibu soaked pineapple and coconut cake, it was not only beautiful, but also delicious! Oh yea! And then Jenny and her little brother broke into a DANCE OFF!!! Can it get any better than this?